When an artist works with a torch flame of 2000°F and a kiln that goes to 1480°F to melt glass, she needs a special, safe place. My studio is a construction trailer next to my home, and working with glass in all its forms and temperatures takes great care. But I love it!! Sixteen years ago I was inspired by an art jewelry magazine to begin creating torch-worked art glass beads and pendants. So glass rods from Murano, Italy, and tools and torch from Scarborough were purchased and gathered. I’ve played with many other elements compatible with the glass to create many unique pendants through the years, learning a number of techniques along the way. Molten glass is fascinating but sometimes has a mind of its own! It is glowing orange when I put it into the annealing kiln so I don’t know totally what it will look like until it cools down the next morning! Wow! ‘Love that one! Five years ago fused glass techniques began to call me. This starts as sheet glass, and after creating a piece it is fired in a special kiln. Besides its own unique tools, I needed and added other equipment, including a grinder and a glass saw - cutting is done with diamonds! Of course, my creative imagination needs many other glass elements to be added to the design: frit, powder, shards, stringer, powder, enamels, lustres, and dichroic glass. I’ve learned a number of techniques to make my own components as well: vitrograph stringers, glass rods curved on the torch, screen melts, and more. 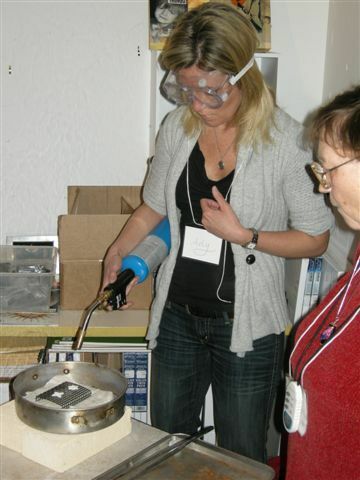 I often have to wear a respirator and gloves when handling the finer glass particles. 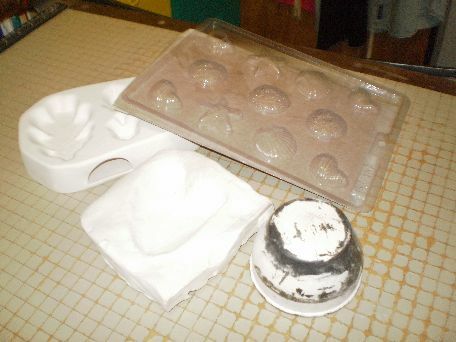 I began using commercial molds to make dishes and paperweights. However, I’ve been creating my own molds to make objets d’art that are totally distinctive. These take many, many bits of glass to fill. 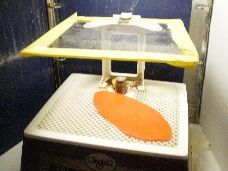 Molten glass will stick to other materials; different barriers or releases need to be used so that the piece comes off the kiln shelf or out of the mold. Sometimes there is coldworking with diamonds after to create a smooth edge. 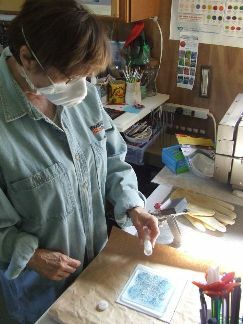 Through the years I have had students join me in my studio for lessons in beadmaking, pure silver Art Clay jewelry, wirework jewelry, and other glass techniques. It’s always a joy to share these amazing media! 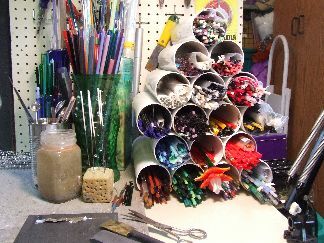 If you are curious about how glass art is created or would like to see my studio (and all the art glass I’ve collected!) get in touch. I’d love to share my space with you.